You’re never too old to go on the journey of a lifetime! A wonderfully warm and energetic Kiwi adventure. Hip Hop-eration follows a troupe of courageous, yet cheeky, senior citizens on an extraordinary quest to perform at the World Hip Hop Championships in Las Vegas. 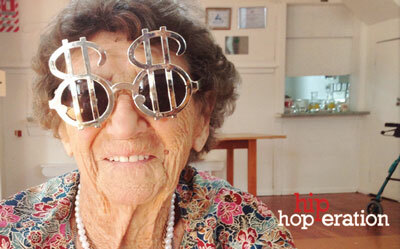 Hip Hop-eration is a poetic feel-good film that proves age has no limits and that hip-hop can set you free. It will make you want to celebrate life regardless of age or condition. We wish to acknowledge a special thanks to the following businesses who have been instrumental in helping to make this film possible. For a full list of those involved, click here.